The field of ethics is constantly changing, requiring you to continually update your knowledge and skills in this area. Dr. Susan Zoline will provide you with an overview of contemporary clinical, ethical, and legal dilemmas faced by mental health professionals. You will be provided clear strategies for approaching and resolving ethical dilemmas with particular attention to boundary issues, high risk situations (suicide, violence, and abuse) and risk management. Case examples will be examined and group discussion will be integrated into the presentation to illustrate the grey areas surrounding these complex issues. Dr. Zoline brings a wealth of knowledge and experience to this program, having taught graduate level ethics courses for 25 years and serving as the co-chair of her state psychological association ethics committee, which she has been a member of for many years. She brings enthusiasm and clarity to a topic which is often considered dry and anxiety provoking. CD recording with electronic manual and instructions. Identify distinct clinical, ethical and legal responsibilities and duties in mental health clinical practice. Demonstrate clear strategies for approaching and responding to ethical dilemmas using a step-by-step decision making model. 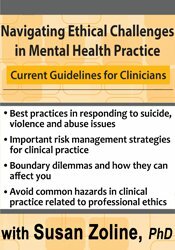 Illustrate current best practice knowledge and guidelines for assessing and responding to clients who present with risk of suicide, violence and/or possible abuse or neglect. Incorporate important confidentiality, informed consent and risk management safeguards/procedures into one’s clinical practice. Recognize common boundary dilemmas that emerge in clinical practice with recommendations to maintain healthy professional boundaries. Identify multicultural diversity factors that may impact ethical decision making. Discuss common pitfalls in clinical practice that could cause ethical or legal liability. Confidentiality, privacy and privilege: How do they differ? This self-study course includes 6.25 hours of general ethics instruction. Not all boards allow ethics credit for self-study products. If ethics is not specified within your licensing board’s approval statement below, please contact your board to determine the applicability and amount of ethics allowed.